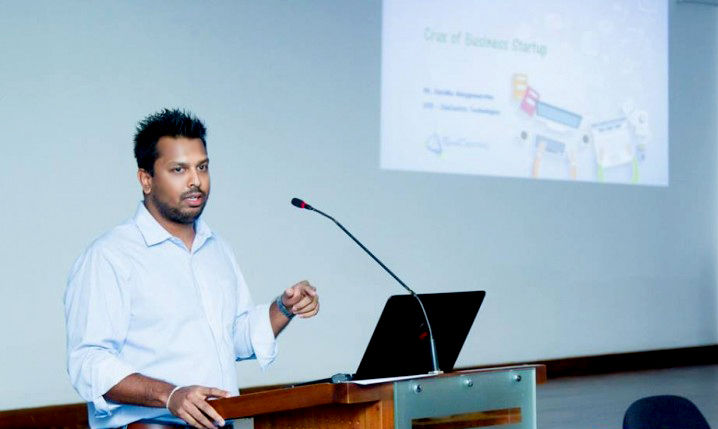 Software development companies are not a new thing in Sri Lanka nor are they in short supply. However, this week we had a lovely chat with Haridhu Abeygoonaratne, the General Manager of SimCentric Technologies, which is a R&D company specializing in advanced simulation add-ons and behaviour control modules, located at the Orion City IT Park in Sri Lanka that creates and sells simulation based products to the great militaries of the world. SimCentric does not do any business in Sri Lanka at this time but the company is a Sri Lankan start up and not a part of any other organization and all its intellectual property rights are held in Sri Lanka. It was set up by two PhD holders from Oxford University, one of whom is a Sri Lankan. Their work is exciting because the software that they develop allows militaries to train soldiers for missions using computer simulations without having to do real world training. SimCentric works in partnership with Bohemia Interactive Simulations (BIS). BIS is the developer of the highly complex and versatile Virtual Battle Space 3 simulation engine (VBS 3) and SimCentric designs the add-ons and the Application Programming Interface (API) for that engine. The engine has everything from intricate maps to military units like battle vehicles and troops. Maps are detailed based on GPS and other geotypical information and can be used to run life-like simulations of battle field operations. SimCentric sells two main off the shelf products, one for artillery fire training and the other for close air support. When training for artillery missions, according Haridhu, the artillery guns remain far behind enemy lines and scouts are sent forward to relay information back. This information is used to target the attack. A real world training exercise for an operation of this nature would require vast tracts of land, arms, ammunition and financial resources and would be extremely time consuming to set up. Instead, the world’s major militaries use solutions developed by SimCentric to run life-like training simulations for such operations. The second product is Close Air Support, which is used when troops on the ground call in an air strike or for aerial assistance. Haridhu used the example of the Transformers movie where sequences like that can be seen, to illustrate. In this case too it is very complicated and resource intensive for militaries to conduct real-world training exercises. In some cases, it may actually be impossible to do so and this is where simulation based training comes in, allowing training for these exercises to be conducted at a much lower cost and with the added benefit of being able to run through them as many times as necessary. In addition to these benefits, simulation based training is also very flexible in that troops can literally be trained anywhere and the equipment is portable which means it can even be taken onto the battlefield to provide onsite training. Using the solutions that SimCentric develops it is possible to adapt the software to any kind of simulator to provide training in diverse environments, vehicles or equipment. These products adapt easily and can be used by flight simulators or even battle tank simulators for any training purpose. Generally such training exercises are conducted in large computer lab environments which make it difficult for one instructor to monitor exactly what each trainee is doing. Based on this, SimCentrics has developed yet another breakthrough technology branded TrainingMate. TrainingMate allows militaries to maximise the efficacy of VBS3 in battle lab training environments. It is a tool which allows an instructor to monitor trainees’ performance, easily launch and conduct training scenarios and to provide real-time feedback or instructions to trainees during a scenario all without moving around a classroom. It also allows the instructor to operate from a remote location, which gives even more flexibility. This has resolved a lot of problems for training, especially on the part of the instructors who need not move around a classroom anymore and can clearly see exactly what every trainee is doing through screen share, remote assistance and other features. After spending years on military simulation solutions, Haridhu now says they are working on adapting the TrainingMate platform to the education sector with a product branded Oxspire Classroom. The applications for such technology in education are vast and possibly ground breaking especially in a computer lab environment. Imagine attending computer classes and being able to receive one-on-one instructions from the best instructors who need not even be at the same location as the students or even in the same country. According to Haridhu, SimCentric is not looking to profit off of this technology from the Sri Lankan market and is happy to offer this to the local education sector at a very affordable price, as a way of giving back to their homeland. 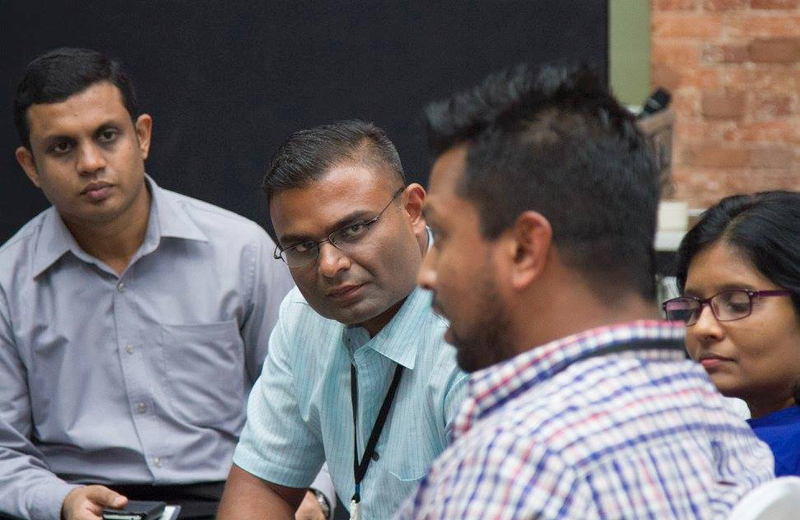 Speaking about what sets SimCentric apart from other software companies at Orion City and in Sri Lanka, Haridhu had this to say, ‘What sets us apart at SimCentric is our people. We truly have an exceptional team. It’s a young team and we don’t believe in unnecessary hierarchies and encourage an open environment where everyone can contribute. We have a healthy mix of staff from different ethnicities, genders and from state and private universities. Diversity is essential for innovation. We also encourage responsible behaviour amongst our staff, for example during the recent flood situation in the country, our team collectively decided to cut down on some entertainment expenditure and contribute that money towards relief efforts. This was not a management decision but a collective decision made by our employees. This is not to say that we have absolutely no hierarchy. We do, but for administrative purposes only. ‘We largely like to keep to ourselves, particularly because of the sensitive nature of our work. But I think now it’s time to let people know about our start-up success story. People in Sri Lanka and investors abroad both need to know that our country has a well-educated, sophisticated workforce and vast amounts of untapped talent. It’s not only a good place for basic software development but also for more sophisticated software products. This is very well supported by the plans laid out by the Sri Lanka Association for Software and Services Companies or SLASSCOM. I myself am part of SLASSCOM and this gives me a platform to encourage entrepreneurship and share our story so others can be inspired. Visit SimCentric Technologies website and Facebook page to learn more about their work.